It's summertime! The weather is delightful, the flowers are abloom, and the sun is shining. 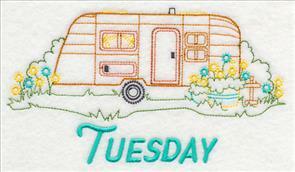 These new warm weather-inspired designs embrace the best that summer has to offer, and are new for you today! 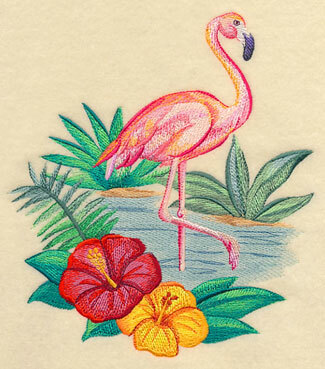 Flamingo and hibiscus in watercolor will have you itchin' for summer stitchin', while a fun variety of campers will inspire you to hit the road. 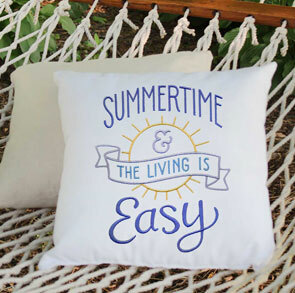 Colorful getaway silhouettes are brilliant on pretty pillows, and summer sayings shine on towels, wall hangings, and T-shirts. 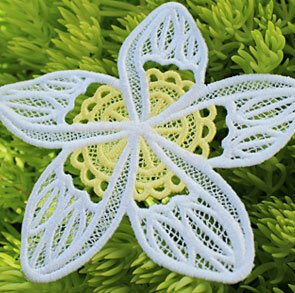 Plus, new lace flowers bring the beauty of the tropics to your home! 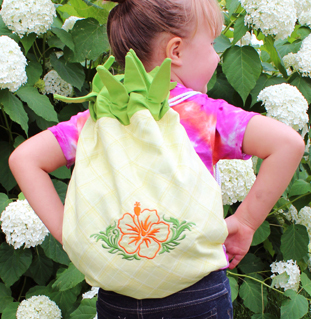 This adorable pineapple backpack is a sweet gift for any child. 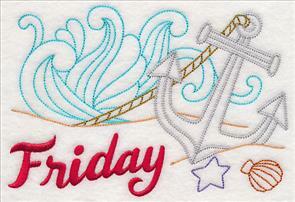 Find the step-by-step tutorial here and the design used here. 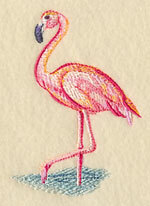 A majestic flamingo enjoys the summer weather in these jaw-dropping designs. 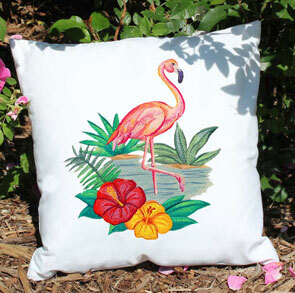 Surrounded by hibiscus blooms and lush greenery, these motifs are fabulous on pillows, totes, and more. 7.00" x 7.79" and 6.39" x 7.07"
6.02" x 11.73" and 4.80" x 9.38"
4.00" x 7.79" and 3.51" x 6.86"
The beauty of this flamingo scene is a perfect pairing with the brushstrokes and color choice found in watercolor paintings. Bring this striking design to your next project -- terrific for pillows, quilts, beach bags, and more! 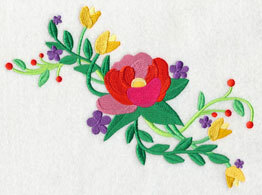 A brilliant blooming border showcases the layers of color, depth, and texture found in watercolor machine embroidery designs. 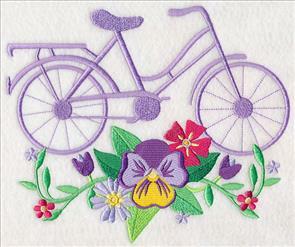 Stitch on a quilt, table linens, or jacket back. 11.68" x 3.89" and 9.36" x 3.10" and 7.77" x 2.61" and 6.00" x 2.23"
Coordinate the designs above with a matching corner, and two accessory designs. 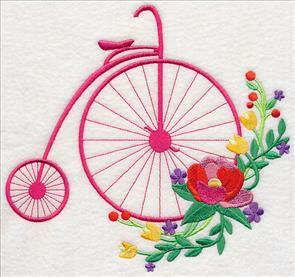 Beautiful additions to pockets, placemats, napkins, golf shirts, and more! 5.82" x 5.84" and 4.82" x 4.84"
Get these light and colorful flamingo and hibiscus designs using the links above, or get them all in a design pack! 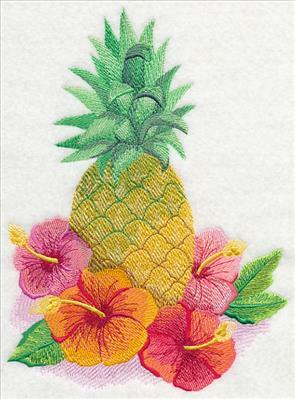 Bright and colorful, this pineapple adds a striking look to pillows, quilts, and wall hangings. 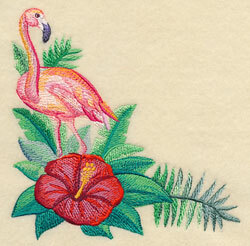 Stitched in the watercolor style and framed by beautiful hibiscus blooms, it's a gorgeous addition to any project. 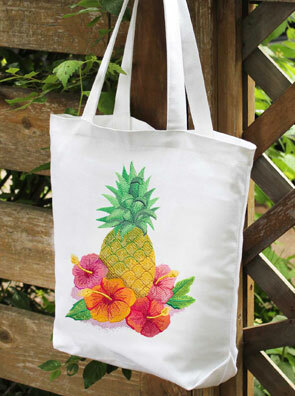 6.90" x 9.29" and 5.79" x 7.80" and 4.85" x 6.54"
No summer day is complete without a stunning pineapple tote bag! 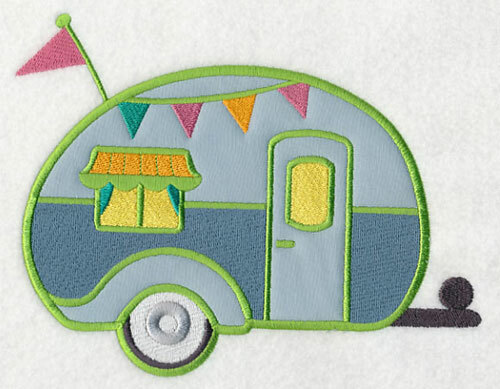 Hit the road in style with these summer getaway designs. 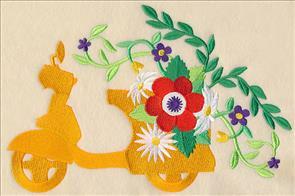 Each of the modes of transportation (a bike, penny farthing, tandem bicycle, and scooter) are stitched in vibrant silhouettes and are paired with a beautiful spray of flowers. 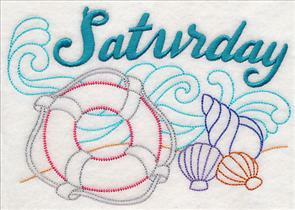 8.17" x 6.85" and 7.51" x 6.30"
7.81" x 7.28" and 7.35" x 6.85"
Embroider your favorite wheels onto tote bags, gardening gear, T-shirts, and more. 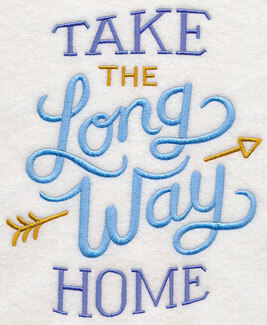 Or, stitch them all on a quilt or series of wall hangings! 11.47" x 6.86" and 9.41" x 5.63"
10.42" x 6.86" and 8.90" x 5.86"
7.81" x 5.14" and 6.86" x 4.52"
In addition to the silhouettes above, two coordinating sprays have been created. Breathtaking accompaniments to the vivid getaway designs! 11.75" x 6.45" and 9.41" x 5.16"
8.94" x 6.84" and 7.70" x 5.89"
6.93" x 5.29" and 6.34" x 4.85"
Celebrate the laid-back style of summer with sweet sayings. 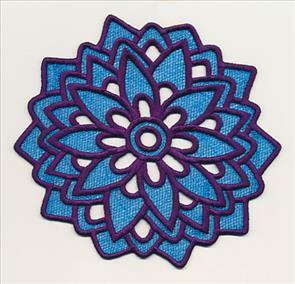 They're inspiring embroidery embellishments for pillows, patio furniture, outdoor umbrellas, and more! Add a summery look to your backyard and patio decor with these sunshine samplers. 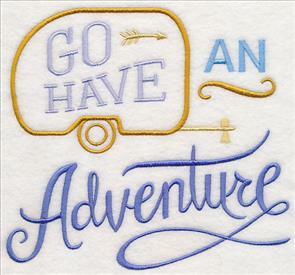 6.37" x 7.82" and 5.87" x 7.21"
4.87" x 5.98" and 3.16" x 3.88"
Bring out your inner adventurer with an embroidered quote on backpacks and T-shirts. 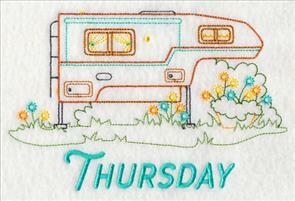 Perfect for road trippers or wanderers, these designs are delightful for any summer stitching. 7.45" x 6.86" and 6.37" x 5.86"
6.45" x 7.83" and 5.86" x 7.11"
4.86" x 5.90" and 3.20" x 3.88"
Crazy for campers? 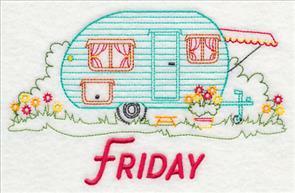 Stitch one for every day of the week with this new set of vintage-style designs. 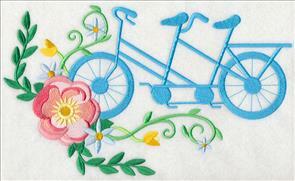 Perfect for tea and floursack towels, these bright and colorful designs will brighten up any kitchen. 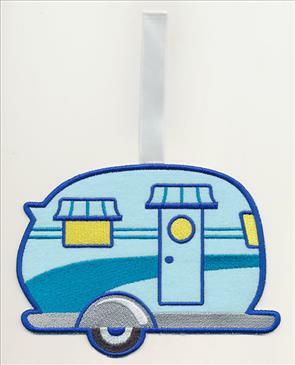 6.82" x 3.81" and 3.85" x 2.15"
Each of the designs features a different style of camper, ranging from canned ham to pop-up and so many more. 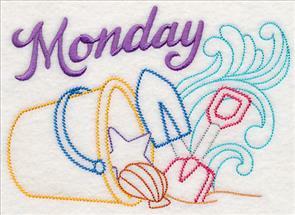 Pick your favorite to stitch alone, or use them all! 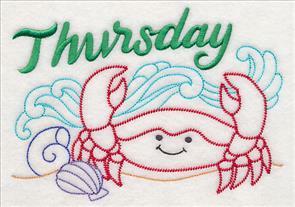 6.82" x 4.36" and 3.85" x 2.46"
The text is included in the last color stop of these designs, so it's easy to leave off the days of the week. 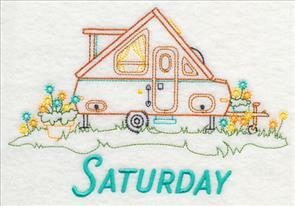 Also great on camping gear, pillows, quilts, and more. 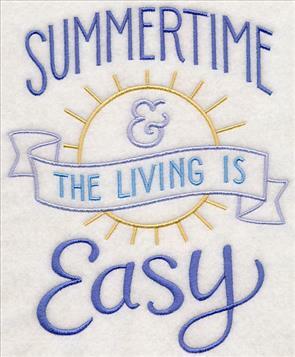 6.53" x 4.08" and 3.84" x 2.41"
Anyone will be a happy camper when gifted with a set of towels featuring these light, quick-stitching designs! 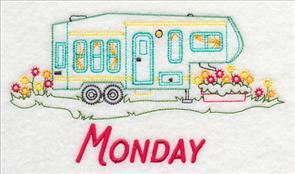 6.85" x 4.66" and 3.85" x 2.63"
These Days of the Week designs are perfect for the camping maven in your life! Get the designs individually by using the links above, or purchase them all in a design pack. 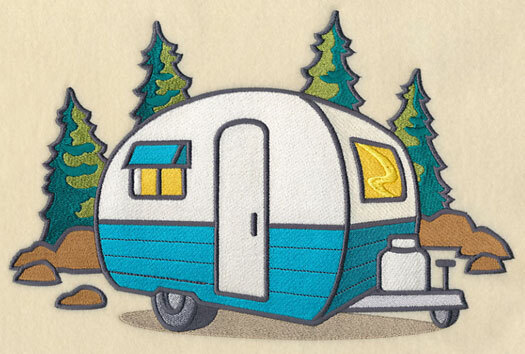 A classic camper scene is perfect for framed artwork, wall hangings, and pillows for your home away from home. The bold, graphic style makes it a contemporary addition to any project. 10.49" x 6.90" and 8.91" x 5.86" and 7.80" x 5.12" and 6.87" x 4.51" and 3.86" x 2.53"
An applique canned ham allows you to use your favorite fabric in your project. The sweet bunting and pennant add an extra hit of summer swag. 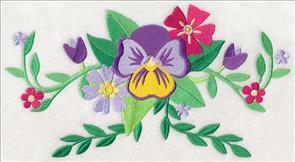 Find instructions for applique designs on the Embroidery Library project website here. 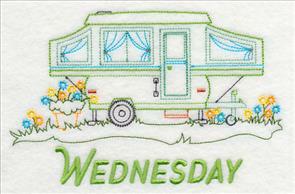 7.66" x 5.88" and 6.34" x 4.87" and 3.85" x 2.99"
Quilts, table linens, and more will get a whole new look with this camping border. 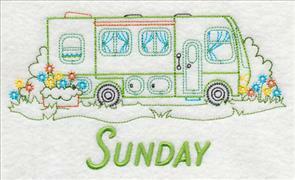 The classic canned ham camper is shown next to evergreen trees and a bright, shining sun. 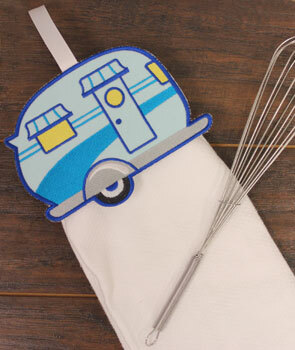 11.75" x 2.44" and 9.41" x 1.96" and 7.81" x 1.63" and 6.00" x 1.52" and 3.00" x 1.25"
Towel toppers designs are ever popular, and this camper version is the perfect way to explore this type of embroidery. A great way to spice up your kitchen decor! 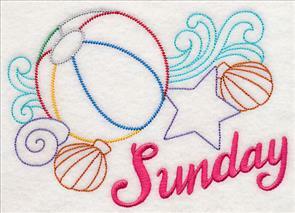 Find the project tutorial for in-the-hoop towel toppers here. 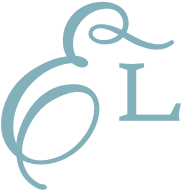 Find even more towel topper designs available right here. 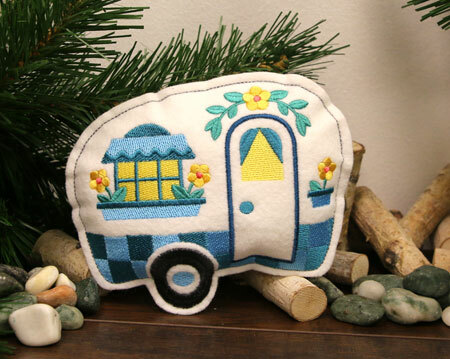 6.69" x 4.90" and 3.90" x 2.87"
Whip up this stuffed, in-the-hoop camper to display in the kitchen, in windows, or even on a Christmas tree! Project instructions demonstrate how to make the adorable decoration. 7.07" x 5.85" and 5.86" x 4.85" and 3.88" x 3.21"
Tropical flowers are one of the many sights of summer, and are gorgeous ways to celebrate the warm weather. Three new lace flowers (a hibiscus, dahlia, and frangipani) are showstopping additions to any home! 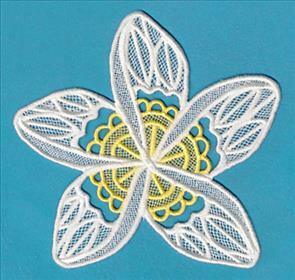 See the project instructions for these lace pieces here. 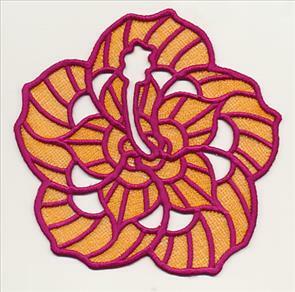 5.87" x 5.93" and 4.85" x 4.90" and 3.84" x 3.89"
Each of the lace tropical flowers use two colors for varying levels of depth and texture. See how to work with multi-color lace in this free tutorial. 5.93" x 5.88" and 4.90" x 4.86" and 3.89" x 3.86"
The two colors in this frangipani design show the different shades of the live flower. 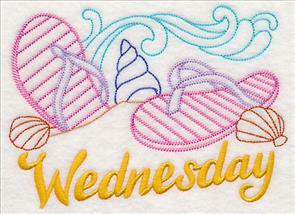 Lyla wrote in saying she loves stitching out the Days of the Week designs, and would enjoy a set based on a beach theme. What a brilliant idea, Lyla! 6.69" x 4.79" and 3.90" x 2.78"
Sand toys, oceanfront critters, flowing waves, and more give each of these seven designs the classic look and feel of the beach. A bright color palette is the perfect way to spruce up any project! 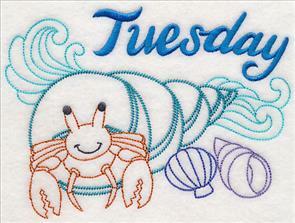 6.77" x 4.83" and 3.86" x 2.76"
Stitch the designs on a set of kitchen towels -- or, use on totes, swimsuit cover-ups, beach bags, and more! The text is stitched on the last color stop, and can easily be left off. 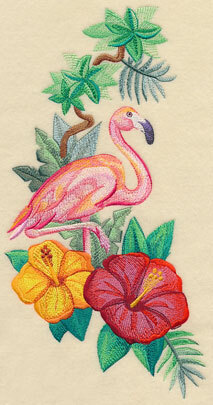 6.78" x 4.61" and 3.89" x 2.64"
Add a tropical look to your next project with these Days of the Week designs! 6.84" x 4.85" and 3.86" x 2.74"
Add a beachy look to kitchen towels with these splash-tastic designs! Order each one individually by using the links above, or purchase them all in a design pack.